An old salt mine southeast of Henties Bay aroused the curiosity of many residents and tourists who have heard of its existence and would liked to visit there. The Henties Bay Tourism Association, in cooperation with the tourist officer marked a route and compiled a map with directions and GPS coordinates. Map and GPS coordinates are available at the Henties Bay Tourism Center. Unfortunately this old mine was raided recently and all the old implements removed, probably sold as scrap metal – or maybe the once rightful owner “rehabilitated” as should have been done many years ago. 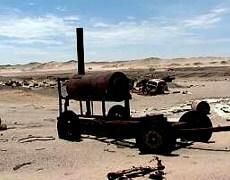 All that’s left now are these photographs but judging by the implements left scattered around the man-made salt pans such as a kind of boiler, a grader, a truck loaded with bags of salt, wheelbarrows etc., it seems that the owner probably abandoned the mine, bankrupt – a history that has repeated itself in the Namib Desert and Skeleton Coast since the times of the early settlers. The man made salt pans are still clearly visible – be sure to drive around them as they are very porous and vehicles will surely get stuck. Another curious sight is a heap of whale bones next to the mining area – probably dragged all the way from the beach to use the blubber, which might suggest the reason for the boiler. 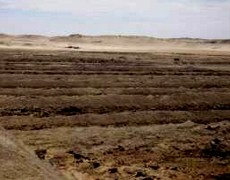 A short distance north-east of the whale bones is a small hill where quartz crystals can be found. 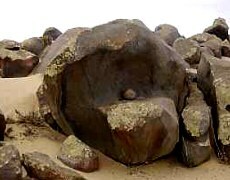 Another interesting phenomenon in the desert is the so-called “driekanter” (three corners) or ventifacts, triangular stones shaped something like a Brazil nut, indicating the direction of the prevailing wind. This stone pointed east, indicating that the western wind is the prevailing wind. Further south along the route granite boulders are an interesting feature.